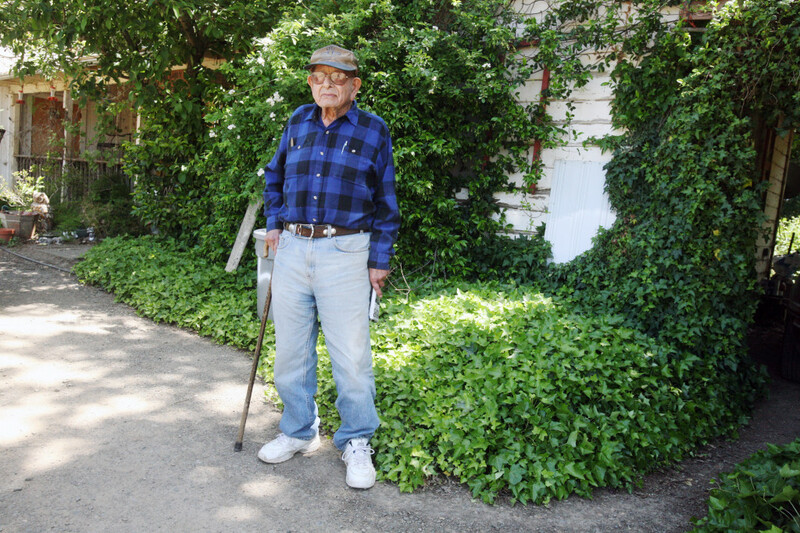 John Lopez stands in front of his house on Thursday in Napa County. Lopez recently discovered that he is related to a person who travelled with Junipero Serra. Mike Clark used genealogy to trace Lopez' roots. FAIRFIELD — So what’s in your historical closet? John Lopez’s friends and family knew he led a colorful life. What no one knew, until a family friend did some digging, was that his ancestry was equally colorful. “John used to joke that he had no ancestry, which is far from the truth,” said Mike Clark, a family friend whose wife’s family lives nearby in the Gordon Valley area. Clark, who enjoys doing research, embarked on several genealogy projects, including that of the 94-year-old Lopez and Lopez’s wife, Betty. Clark discovered that Lopez, through his maternal grandfather’s side of the family, is directly associated with Spanish settlers instrumental in settling California. Chief among these settlers is Junipero Serra, the Franciscan friar who founded the California mission chain. He also is connected to Juan Batista de Anza and Gen. Mariano Vallejo. Clark combed through records upon records, read books upon books. He interviewed both Lopezes, looking for names and incidences he could connect to historical information. He looked through census records, California mission records, church archives and the Early California Population Project sponsored by the Huntington Library. And, of course, Ancestry.com. What he found delighted him and astounded John Lopez, who is a military veteran and former ranch hand in Rio Vista. “It’s amazing what you can find out with a few names,” Betty Lopez said. Lopez’s great-great-great-great grandfather – Manuel Rodriguez – was tapped by Serra to come with him from Guadalajara, Mexico, in March 1774 as a carpenter. He, along with Serra, two other carpenters, two blacksmiths and their families, arrived in San Diego on the ship the Santiago. According to Clark’s documents, the 1775 census showed Rodriguez still in San Diego, but mission records at San Carlos Borromeo de Carmelo Mission – also known as the Carmel Mission – show that by 1781 he had moved to Monterey and was listed as the carpenter for the Monterey Presidio. He was still listed as the carpenter at that location in 1788, as well. Serra also was in Monterey at this time. This is enlightening information for the Lopez family because that indicates that Rodriguez, the only carpenter listed at the time, was there at the time of Serra’s 1784 death at the Carmel Mission. Based on the dates Clark identified, and on historical information about the carpenter, it’s likely that Rodriguez was the carpenter who built the “simple, redwood” coffin in which Serra was laid to rest. Other records indicate that Rodriguez married at the Carmel Mission on Nov. 11, 1781, and that Serra baptized their first-born, Damaso Antonio Rodriguez, on Dec. 15, 1782. Damaso Rodriguez became a soldier at the Monterey Presidio, eventually reaching the rank of corporal. He was stationed at several locations but in 1837 wound up at Mission San Francisco de Solano, or Mission Sonoma, located in Sonoma, serving on Gen. Mariano Vallejo’s staff. A land grant is exactly what the general helped Damaso Rodriguez receive from then-Gov. Juan Alvarado in 1841, Clark said he discovered. The grant was 6,654 acres and known as Yajome Rancho. It was east of the Napa River and north of the present town of Napa. “If things turned out differently, John could’ve died owning Napa,” Clark said, chuckling. Finding a local connection completed a circle for John Lopez, who was born in San Luis Obispo but wound up living, unbeknownst to him at the time, not far from where his ancestors lived, worked and died. Manuel Rodriguez sailed with Junipero Serra from Guadalajara, Mexico, to San Diego on the ship Santiago. It took 49 days, making landfall on March 14, 1774. The 1790 census lists both Manual and Maria Rodriguez as mestizo, which means mixed Spanish and Indian ancestry. Junipero Serra baptized Manuel and Maria Rodriguez’s first-born son, Damaso Antonio Rodriguez, four days after his birth, Dec. 15, 1782. Based on various records, Mike Clark has identified Manuel Rodriguez as the carpenter who built the “simple, redwood” coffin in which Junipero Serra was buried in 1784. Damaso Rodriguez received a land grant of 6,654 acres from Gov. Juan Alvarado in 1841, near present-day Napa. It was not occupied before Damaso Rodriguez died during the Bear Flag Revolt. Reach Susan Winlow at 427-6955 or swinlow@dailyrepublic.net. Follow her on Twitter at www.twitter.com/swinlowdr.